In the 1930’s, an American toilet bowl brush manufacturer changed the look of artificial trees. The Addis Brush Company created the first artificial brush tree. This tree was actually manufactured using the same equipment as the company’s toilet brushes. The introduction of these trees increased the popularity of the artificial tree. Addis Brush Company continued manufacturing trees along side their toilet brushes. 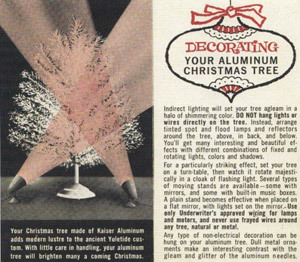 In 1950, the company received a patent for an aluminum tree. The “Silver Pine” had a rotating light source underneath it. Color gels changed the shade of the light as it revolved around the tree. 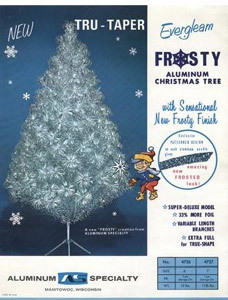 The popularity of this tree led other companies to begin manufacturing aluminum trees. Modern Coatings made trees in 1958 and Aluminum Specialty Company manufactured over a million aluminum trees between 1959 and 1969. Aluminum Christmas trees could not be lit using strings of lights for fear of electrical shock. Revolving lights like those on the Silver Pine became extremely popular. These space age trees could be found in many houses during the 1950’s and early 1960’s. The reason behind the decline in sales of aluminum trees is rather surprisingly. In 1965, a popular cartoon Christmas special portrayed these trees in a very negative way. Instead of choosing a aluminum pink tree as requested by Lucy, in Charlie Brown’s Christmas, Charlie chooses a small real live tree to protest the commercialization of the holiday. After the airing of this special, the popularity of the aluminum tree waned. Gone are the days of toilet brush and pink aluminum trees. Today artificial trees closely resemble their live counter parts. Thank you Charlie Brown! ← Invention Geek – Hand Warmers?